Ralph Bown, IRE President, 1927, focused on improving long-distance communication, and he led the press conference that announced the invention of the transistor. Ralph Bown was born in Fairport, NY in 1891. He received an M.E., M.M.E., and Ph.D., degrees from Cornell University, where he also taught in the physics department. He then served as a captain in the Signal Corps in World War I. In 1919, he joined the development and research department of the American Telephone and Telegraph Company. With that department, he went to the Bell Laboratories in 1934. Much of Dr. Bown's work was concerned with various aspects of radio broadcasting and ship-to-shore and overseas telephony. His efforts to improve long-distance communication resulted in many communications patents. As Bell research director in 1948, Dr. Bown led the press conference that announced the invention of the transistor. 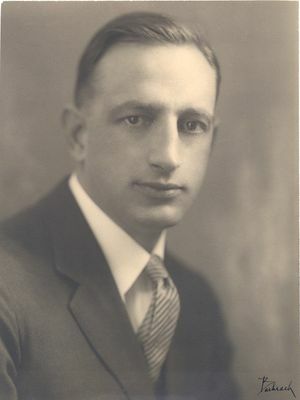 Bown’s service to the company was recognized by his being made of vice president of Bell Telephone Laboratories before his 1956 retirement. Bown also used his talents to assist the military. He was a division member and consultant of the National Defense Research Committee, specializing in radar, and in 1941 visited England to study radar operations under combat conditions. He also served as an expert consultant to the Secretary of War. Dr. Bown was internationally recognized for his pioneering research and development work in the field of communications engineering. He received the IRE Morris Liebmann Memorial Prize in 1926, and served as President of the Institute in 1927. In 1949, he received the IRE Medal of Honor, "for his extensive contributions to the field of radio and for his leadership in Institute affairs." Dr. Bown was married and he and his wife, Alma, had two sons and nine grandchildren. Bown died on 29 July 1971, at the age of 80. This page was last edited on 24 February 2016, at 14:58.